Municipal Chamber of Caruaru, the local legislature. 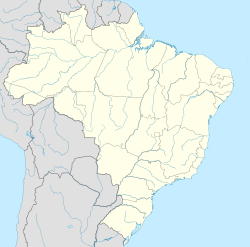 Caruaru have one regional airport, the Oscar Laranjeira Airport, it is located in the west parte of the city, the nearest major international airport is the Recife/Guararapes–Gilberto Freyre International Airport in Recife which is 138 km far from the city. The city is served by two expressways, the BR-232 and the BR-104. Every June, as part of the nativity of St John the Baptist, Caruaru hosts one of the principal Brazilian Festa Junina. Since 1994, the festival has been held in Pátio de Eventos Luiz Gonzaga. Wikivoyage has a travel guide for Caruaru. Wikimedia Commons has media related to Caruaru. This page was last edited on 5 December 2018, at 16:40 (UTC).